You no doubt have noticed that work has begun on Phase II of Borgfeld Road, that section from Timberline Drive all the way up to Blanco Road. Expect delays in travel along this route for the foreseeable future! This project will finally begin this year. Phase I (that portion from 1604 to Stone Oak Parkway) broke ground on April 1. Actual construction will start May 2017 and take approximately three years to complete. Project cost is $192 million for this portion of the project. You may also have noticed the VIA Bus Terminal/Station being constructed at Stone Oak Parkway and US 281. Phase II of the project expansion – Stone Oak/TPC to the Comal county line is projected to start construction in 2019. This portion of the project is estimated to cost $182 million. As all these projects are being started we will experience longer commutes and traffic delays so plan ahead! Meeting opened with commentary about the success of the BBQ Event over the weekend. BBQ plates were sold for donations. Ricky Gonzales and Clean Scapes Landscaping paid the costs of the food that was prepared for the plates to be sold for donations. This allowed the total raised for our Volunteer Fire Department to reach $1500.00. A presentation about the upcoming Comal ISD Bond was given. The bond includes, among other things, funding to build a Timberwood area high school on Borgfeld Road which will be located next to the middle school currently under construction. The bond package totals $263.5 million. Construction for the high school was estimated to complete in 2021 if the bond passes. Early voting begins April 24. A summary and brief discussion of the HOA aging report/financials was given which showed the outstanding balances owed in property owner assessments to the association from 2011 to present. A new events coordinator was hired and introduced to the audience and welcomed to the community. 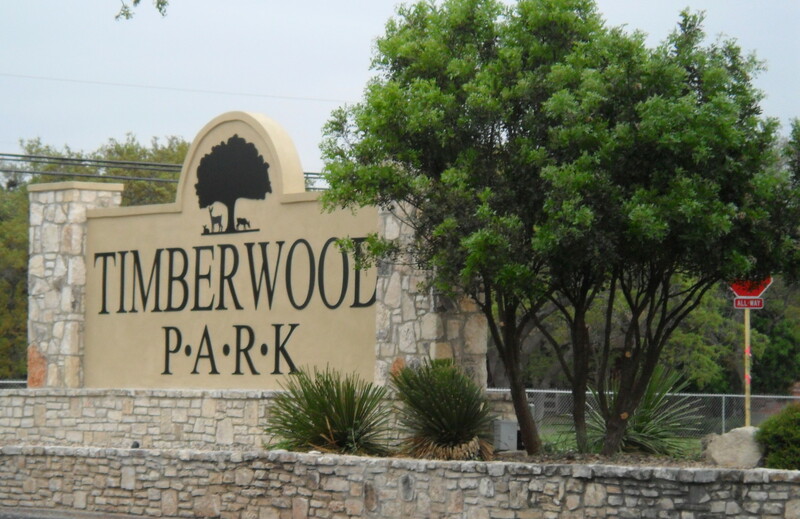 The Park Master Plan was presented in its semi-draft state to the audience. Some of the proposed/potential additions to the park include a dog park, expanded kids’ playground, utility sports field (soccer and other) with field (astro) turf on it, an expanded platform for the swim meet teams to line up in the pool area, extra parking spaces, a more private location for the park managers to live (it was not clear if that meant the building would be moved or if it meant the existing structure would be fenced in), an expanded main parking lot which will encroach on the new volleyball court, the volleyball court being moved over near the playground, horseshoe area, an additional loop of walking track at the back side of the park, 3 docks into the lake. Nothing has been finalized at this time according to the board report on progress made thus far. No costs were shown for these proposed improvements but the architect that was chosen for the master plan work was in the audience and presented his vision for the park and grounds. He indicated costs would be a factor in completing any or all the plan (he indicated he has provided line item costs for each suggested/potential improvement to the board) and the clubhouse is still a vision which has not been finalized. Whether that meant remodel or build new, he still wasn’t sure but that the team (his company and associated landscaping team) had concluded that the location should be generally where it is. A question was asked about more bathrooms on the potential dog park side of the park (back gate) and a brief discussion was held about that option. Architect indicated that the average price for a stick build right now is estimated at $150.0o per square foot and he was contemplating something along the lines of a 6500-7500 square foot building whether new build or renovation. Cost of the master plan came in at $29,500.00. In the next couple of weeks, the digital version of the plan will be completed with specific footage and design elements completed. Architect indicated it was important to consider what the building (clubhouse) would be used for and how it is used now to determine best size, use, etc. Some of the features for the build under consideration include: Game Room 350-400 square feet, Fitness center 1200-1500 square feet, Exterior access for outdoor seating, Small meeting room for 4 to 6 people, Large meeting room, Storage for table and chairs 150-200 square feet, Telephone and utilities closet, Kitchen facilities, Bathrooms accessible to pool and fitness room, Bathrooms for main facility. Security cameras were discussed as a priority by the board and expanding the 9 we have to 14 and upgrading the entire system. Three bids are being considered which depending on the selection of type of service – 1) a maintained system by the provider with a monthly fee to the HOA, 2) provided equipment and install and then the HOA is responsible for failures in equipment and its replacement, or 3) a 2nd version of the same thing with some modifications. Approximate cost if purchased is estimated at $19,000 and if maintained manner about $550.00 a month at this time. Estimates are still being completed. Park lighting was discussed – the board is in the final phases of getting bids for electrical and equipment. It’s going to be expensive. 2 phases proposed – 1st phase the walking trail, 2nd phase the parking lot. Question was asked if it was a good idea to put in lighting if the master plan changes everything? Discussion included that the master plan will be taken into consideration before decisions are made on proceeding with the project. Pool will open April 14th. That’s also MIP night. Brush and mulch becoming a problem as county has been reducing their participation in the process of mulching the brush pile from the event. The board is now looking into alternate options which will cost the neighborhood to manage if it is determined to go that route. Board is considering how to make the project work more effectively but it looks like it may cost 5-10k each time we do it to hire someone to take care of mulching the brush/debris brought in by property owners. There was a crime watch report given which indicated 14 varying incidents for the month of March. Social events were reported in summary with a notation that the Easter Egg hunt was this weekend and volunteers are needed volunteers to guard the eggs and help with set-up. Rummage sale is April 22. MIP is starting April 14 for its season running into fall. There was a brief discussion of a rumor started on Next Door that the board was considering fireworks in the park for the 4th of July. Board said that was not happening this year but it might be under discussion in future years. The board recognized that this was done in the past but had been stopped because of an incident so liability and other issues needed to be determined before further discussion would take place. Board listened to one audience member under citizens to be heard about the bond issue who was not in favor of leveraging 263.5 million dollars in additional debt when we already have a debt service on 600+ million from previously approved bonds that property owners are obligated to. An opposing opinion supporting the bond was given by a teacher in the audience and the meeting was adjourned.